This special Deep Dive series looks at the process and development of up to four new urban renewal districts in Boise under the direction of the Capital City Development Corporation. Each day will bring into focus the idea and work being done. A coalition of ten agencies is hoping to ease traffic along State St. by implementing solutions that could include high-frequency bus routes and changes to land use to promote high-density and transit-oriented projects. “Various partners have been working to make State Street a premium transit corridor for a long time now – since the early (200s),” CCDC project manager Matt Edmond said. 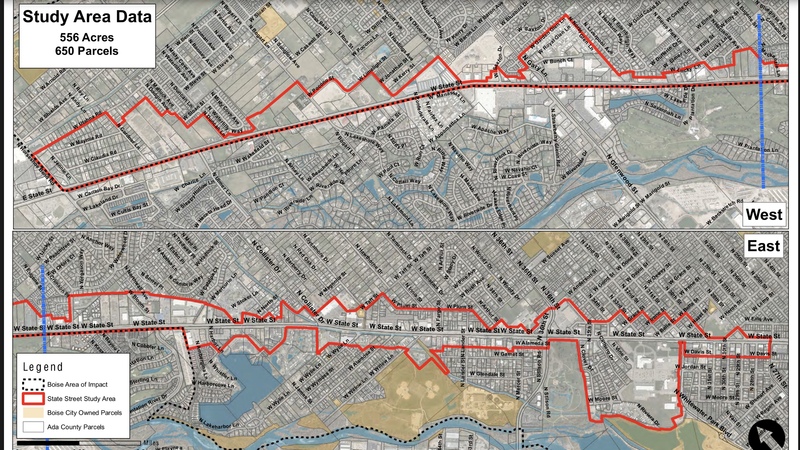 An urban renewal district would follow State St. along both sides of the street from 27th Street in the east to nearly Horseshoe Bend Rd. in the west – with the exception of the land that falls on the south side of the street in Garden City. CCDC is chartered under the City of Boise – and land inside Garden City would have to be taken care of by that city’s urban renewal agency. That agency is currently focused on using urban renewal along the waterfront. Idaho law limits urban renewal in any municipality to property that equals ten percent or less of the total taxable value of the city or town. This could limit any participation by Garden City in a project. On the Boise side of the river, the tax increment financing model could be used to help provide amenities along the transit corridor – including bus shelters, structured parking, and even building out new streets, according to Edmund. Edmond said the “big idea” for this district would be to support a “successful bus rapid transit line,” plus transit-focused infrastructure in the area. Those projects could include bus shelters, parking garages, sidewalks and other improvements. While ACHD is generally the agency in charge of funding the actual roadway, CCDC is hoping TIF can be used for projects along the sides of the street. The conceptual district could also be used to redevelop parcels in ways similar to projects seen in Downtown Boise. “Let’s say ITD was going to divest (its State Street campus) and move to HP – that 40-acre campus would need to be parceled out and roads put within it,” he said. 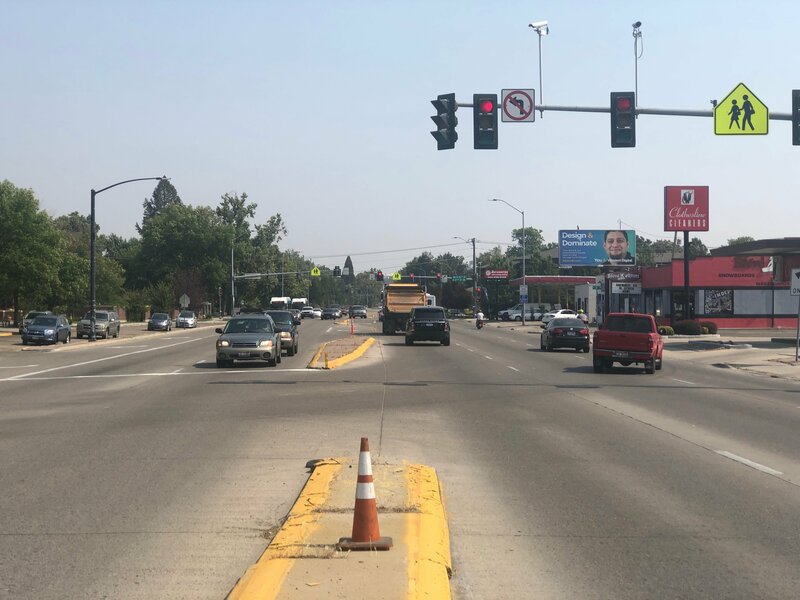 The overall project could help achieve some of the goals of the City’s Transportation Action Plan, but not at the exclusion of cars – which make more than 38,000 trips on State near Veterans’ Memorial Parkway each day, according to 2017 data. State Street now is dominated by buildings set back from the street with surface parking in front. CCDC says parking garages could be part of the mix for State Street much in the way they have been used downtown. He said that parking structures can be useful in making parking a more efficient project for people who use their cars to travel. CCDC Executive Director John Brunelle points out that the State Street project – like the potential Gateway East project – isn’t the same type of urban renewal being used in Boise’s Downtown. The possible State Street district is still in the exploratory phase and the agency has not yet worked out a timeline for when it could move forward.